It's official, Randy Moss was released by the Minnesota Vikings. Just weeks after the Patriots moved him to Minnesota, Moss will now head to Tennessee -- his third home in less than a month. There's no denying that he has been one of the most dynamic talents in the game, while at the same time proving to be a player most football fans love to hate. You love him when he's breaking touchdown records on your team, and hate him when he's embarrassing your defensive backs. You love him when he's giving your team 100 percent, and hate him when you see him take plays, and sometimes games, off when your team needs him the most. It's hard to deny his talent. His resume reads like that of a first-ballot Hall of Famer -- 948 career receptions, 153 career receiving touchdowns, and nearly 15,000 receiving yards. It's also hard to deny that Moss can be one of the most polarizing figures in the NFL. Moss is often times known, by the mainstream, more for who or what he is off the field than what he does on it. The amount of memorable YouTube videos of Moss' antics can cause one to get lost in an online maze, clicking on link after link for hours. Below is what I perceive to be some of the highlights and lowlights of Moss' career, given the time constraints I had permitted myself. Again, it's easy to get lost on YouTube when you get involved in a game of click-through. Interview With Moss About Inta Juice To be fair to Moss, I wanted to start off with one of his more likable moments. It's a little-known fact that Moss is the owner of an Inta Juice franchise in Baton Rouge, Louisiana. Back in 2006, Moss did an interview with Sports Action Team while making smoothies. The Sports Action Team are seasoned comedians, so right off the bat it was clear that this was going to be a fun interview. Moss started by making sure that hosts Kevin Kelly and Al Click didn't get get their suits and ties "nasty" by putting aprons on the duo. This made for what Mr. Click described as a "weird male moment (nothing sexual, on Click's behalf)." What I loved about Moss' demeanor here is that he almost does exactly what his past and, for that matter, future organizations would probably prefer him to do -- make every answer about juice. Click: What's the best non-juice related thing to happen to you? This was, without a doubt, one of the more amiable moments from Randy Moss. He not only played the role he was supposed to play, but he reveled in that role. Imagine that. Moss Jokes Around With Masked Fan Another jovial moment from Moss came back in the 2009 season when he joked around with a Patriots fan who was wearing a Moss mask at Gillette Stadium. The Moss look-alike was broadcast on the jumbo screen in the stadium. When Moss was made aware of the projection by one of his teammates, the fan mimicked Moss' famous touchdown celebration as Moss responded in kind. Moss gestured for the fan to "get outta here" in a friendly way. It's a moment in which he laughs with the crowd and becomes, to put it simply, likable. Whether you were a Patriots fan or a New England hater, you couldn't help but smile when you saw Moss' interaction. This is the kind of Randy Moss that you loved to see. The guy who knew, as Warren Sapp once told me, he was getting paid a king's ransom to play a kid's game. Maybe it was a comfort thing. After all, Moss, as he'll tell you, likes to feel comfortable. Randy Moss Interviews... Himself It's clear that Moss likes to play by his rules. Whether it's answering questions about his on-the-field performance or explaining his off-field conduct. He made it clear in Week 8 that he's going to conduct his own interviews. The media was going to play by his rules, and not the other way around. Maybe he knew he was about to be released by the Vikings, but it sounded to me more like he had product remorse. You don't know what you have 'til it's gone, to use a cliche. His press conference was more about the love he lost than the love he's found. As much as he'd like to bring a Super Bowl to Minnesota, he acknowledged that he was going to take what he learned in New England and "sprinkle" it among his new teammates. He wasn't going to step in and conform to Brad Childress' system in Minnesota. This is the side of Randy Moss that is often criticized. He talks about how he's been wronged. How much respect he has for the team he didn't come through for during the 2009 playoffs. In Moss' reality, his words apparently speak louder than his actions. From a superstar athlete that's a bit disconcerting. Moss Puts the 'W' on Lambeau This next clip from 2008 was taken when Moss was asked about his end zone celebration after the Patriots beat the Packers in Green Bay. Moss may seem like he needs a self-edit here, but I appreciate his earnestness, his passion. Talk about the 'W' and not the individual. What a great concept. That's perfect advice for Moss, by Moss. Worry about the win. It's a bit unfortunate that we've gotten to this place with Randy Moss. He was reborn in New England after two underwhelming seasons in Oakland. His 2007-08 season was one for the record books. How long will it be before we see another wide receiver catch 23 touchdowns in a single season? Even in this, a down year, Moss is on pace to catch double-digit touchdowns. What's happened to the passion? And where did the entitlement come from? The most cringe-worthy part of the Moss-Minnesota divorce was the way that Moss apparently handled himself during a post-practice team meal just this past weekend. Yahoo! Sports' Michael Silver reported on the incident and according to a witness, the whole ordeal was "brutal." Moss at SB XLII: 'I'm Ready to Go Home' His displeasure for being a part of the scenery has been evident for a while. 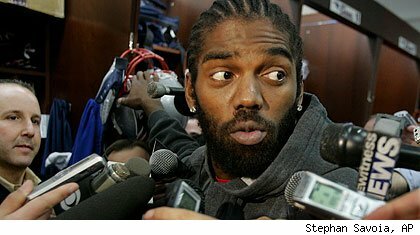 Looking back at the pregame press conference he conducted prior to the start of Super Bowl XLII, Moss made it clear that he wanted to get the game over with. Why? Because he didn't want to be there. He wanted to go home and be with his family. This before the most important game of a player's career. "I'm ready to get home. I'm ready to get it over. It's been somewhat of a decent, OK experience. For all the hype, the media days, the practice, the moving around... I wish this Super Bowl could have been in Miami or somewhere like that. From here it's just, 'let's get the game over with, let's get up outta here, I'm ready to go home.'" He's just ready to go home. This, as you know, is the biggest single moment in a player's career. Or at least what is supposed to be. I don't dislike Randy Moss. In fact, I've always been a fan of his. I for one am a person who roots for talent. But these kinds of moments are hard to get behind. That's the reason why Moss will eventually find a new home this season, most likely with a Super Bowl contender. His game is too beautiful, but his actions refuse to cook. How should Moss respond to the criticism going forward? Maybe he can take a page out of the old 2006 Randy Moss interview handbook. "The way these smoothies are tasting, everything's going good."